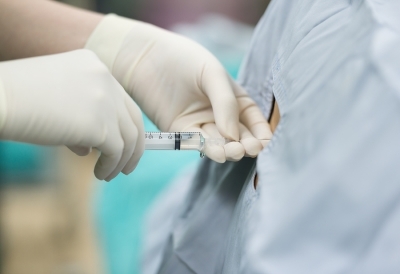 Since a lumbar steroid epidural injection is an in-office procedure, not a surgical procedure, it does not require extensive preparation. However, you should inform your physician of your full medical history, including any prior back procedures, medical conditions, medications, and supplements. Most patients do not require a sedative for this in-office procedure. If you think you may need a sedative, you’ll be instructed to avoid eating or drinking for a period of time before your appointment. You’ll also need to have someone else drive you home. When you arrive at the spine center, you’ll change into a hospital gown. Then, you may be asked to lie on a table, either flat or on your side. Before administering the injection, the spine specialist will sterilize the area of skin on your lower back. He or she will apply a local anesthetic to numb the area and improve your comfort level. Guided by real-time X-ray images called fluoroscopy, the physician inserts the needle into the epidural space. Contrast dye may be used to ensure correct placement. The steroid solution is then slowly injected into the epidural space. In-office procedures require very little recovery time; however, you can expect to remain at the spine center for about 15 to 20 minutes before you are discharged. Although you should rest quietly at home for the rest of the day, most patients resume their normal activities the following day. You may notice some tenderness at the injection site, which you can address by applying ice packs for 10 to 15 minutes at a time.